Everyone knows that breakfast is the most important meal of the day, but did you know that it can help you lose weight, too? Eating a morning meal jump-starts your metabolism, and leads to better eating throughout the day. 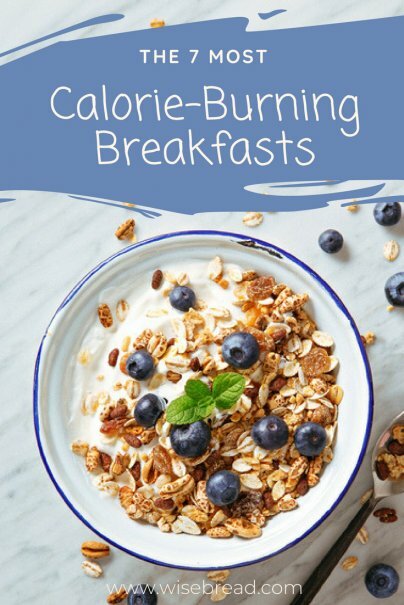 Making smart breakfast choices can mean even better weight loss, since some foods burn more calories than others. High-fiber foods like oatmeal have been shown in studies to help people lose weight. Whole grains help you stay full for longer, leading you to eat less. They help eliminate waste in your body, and they are harder to break down, so your body burns more calories to process them. Steel-cut and rolled oats are best since they contain more fiber than quick-cooking oats. Add cinnamon to your oatmeal for an extra bonus: Cinnamon is lightly sweet, so it adds sweetness without adding calories. It is also believed to aid in metabolizing blood sugar. And nuts add protein and healthy fat for a well-rounded meal. Tofu is perfect for a healthy or weight loss diets since it is a complete, lean protein. A half cup serving of regular tofu provides about 10 grams of protein and is low in calories. Protein keeps you full for longer, keeping hunger (and junk food cravings) at bay. Silken tofu can be surprisingly good for breakfast — just cube it up and throw it in a blender with some frozen fruit, soy milk, and juice, and you have a filling and tasty smoothie. Add in yogurt, chia seeds, or flax for an extra boost. The calcium, protein, and vitamin D in low-fat dairy products can help you lose weight by working in your body to persuade calories to deposit into muscle rather than fat. The calcium found in dairy also helps decrease the level of a vitamin that encourages the growth of fat cells. That's why a bowl of low-fat plain yogurt with berries is a great way to start the day. Plus, the yogurt provides protein and the berries are full of fiber. For a breakfast that won't let you down before lunchtime, toast some whole wheat bread, slather it with a tablespoon of almond butter, and top with sliced banana. The whole grains in the bread will burn extra calories while you digest, the almond butter provides protein and healthy fat to keep you satisfied, and the banana contains resistant starch. Resistant starch is being studied for its effects on blood sugar, body fat storage, and more, and researchers think it could be useful for weight loss. Eggs are an excellent source of protein, which boosts your metabolism. They also contain vitamin B12, which helps to break down and burn fat within the body. Avocado is full of healthy fat that's proven to keep you full for longer, along with boosting your post-meal metabolism. Tomatoes are low-calorie and high-fiber, and chilis contain the red-hot chemical capsaicin. It's what gives hot peppers their bite, and it may help increase energy expenditure after eating, leading to more calories burned. An omelet wraps up all of these calorie-burning ingredients into one healthy and delicious dish. Grapefruits are being studied for their weight loss properties, and may help you burn more calories. One study showed that participants that ate half of a grapefruit before every meal lost 3.6 pounds more than the participants that didn't eat grapefruit. You may not want to eat grapefruit all day, but starting with a half topped with a drizzle of honey will start you on the right foot. Pair it with a cup of low-sugar, whole grain cereal (look for six grams of sugar or less) for a healthy dose of fiber that'll burn calories while you digest. Topped with high-protein low fat milk, you'll have a complete meal to start the day. If you love breakfast pastries like muffins (who doesn't? ), bake a batch that will keep you burning calories and fat after you've gobbled it up. Whole wheat takes extra effort for the body to digest, so you'll burn more calories. Add apple for more fiber and nutrients and natural sweetness. Fresh ginger has been shown to help regulate blood sugar and provide energy while adding lots of flavor to your muffins. Whole wheat muffins packed with good stuff are a delicious way to eat a serving of whole grains, and are easy to take on the go. What's your delicious, healthful breakfast of choice?